Though Mary Doane has only returned “home” to Nova Scotia four years ago – after several years living in Quebec – she has quickly taken the local arts scene by storm. 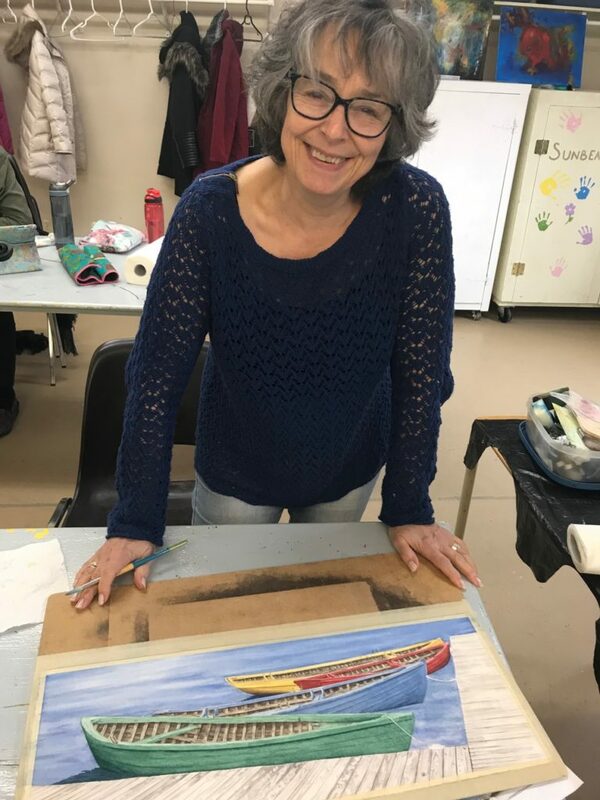 Aside from the PCAFA Studio Tour in July, Mary will be participating in the Symposium de Peinture de Baie-Comeau (https://www.sympobaiecomeau.ca/accueil) from June 25-30 and preparing work for a solo exposition at Gallery Nineteen Nineteen from February 18 – March 20, 2020. (https://www.gallerynineteennineteen.com). Needless to say, retirement is keeping her busy! Like many of us who identify as artists, Mary began her creative journey with good old crayons to wallpaper. Now influenced by realist artists such as Canadian high realists: Alex Coleville, Tom Forrestall and Mary Pratt, Mary is also inspired by everyday items. She explains, “I do tend to collect lots of odds and ends and the tables in our home are inhabited by all manner of knick-knacks. I suppose some would call it clutter but I have the excuse of calling it inspiration! These things tell stories – on their own, but also when paired with other objects.” Living in the Peggy’s Cove area and becoming a member artist of the PCAFA has offered these unique items in abundance and has particularly benefited Mary’s taste for still life and flowers. She describes the festival as “fabulous” (don’t we all?!) and loves “projects like Pieces of Eight and Take Away. They force you to push your creativity in a way or in a direction that you don’t usually do.” Each year the festival manages to offer its members fun new projects that help us think outside the (pizza) box! Today, making art for Mary is a side business and is “always a form of therapy.” Getting lost in our individual creative processes can sometimes be more beneficial than the project itself. Our creative essence – our “thing” – as I like to call it, enables us to get lost in something perfectly personal. We look forward to following Mary’s artistic journey and are so happy to have her home again.